After writing three acclaimed nonfiction books, Kristin made a smashing fiction debut with the bestselling novel An Unexpected Grace. Kristin's books have been translated into twelve languages. She lives on an island in Washington with her husband and their rescued German shepherd, Bridget. From her desk she watches ospreys and seals, and every day an otter wanders through the yard to go for a swim. Visit her on Facebook or at www.kristinvonkreisler.com. 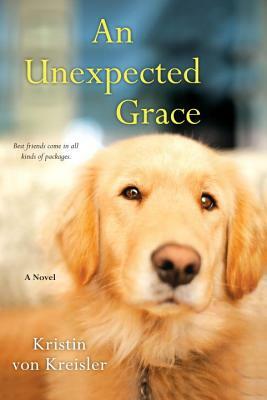 Though An Unexpected Grace is about Grace, a golden retriever, it’s also about the idea of grace, which is the undeserved, unsought good that comes to us.How is Grace a grace to Lila?In what other ways does grace come unexpectedly to her?How does it work in the story? In the beginning, control is very important to Lila when she tries to take control of awkward situations with Yuri Makov and she tells Betsy that all she wants is to get her life under control.How else does it appear in the story?Does Lila’s attitude about control evolve? When Lila is painting during her first days with Grace, Lila alters her breath so it’s not in sync with hers.But after Grace chases away the raccoon and protects Lila all night, she purposely breathes in sync.What does this say about the change in Lila’s feelings for Grace?How does the relationship develop? Why does Betsy want Lila not to see herself as a victim?What difference does it make?How are women who have been truly victimized supposed to view what happened to them? What’s the significance of Betsy covering Lila with a Navajo blanket that has stripes of trees, eagles, and lightning that represent growth, independence, and power?How do these symbols relate to Lila’s journey in the story? Why might Lila paint only closed doors and gates in the beginning?Why might Adam urge her to paint them open?At the end when Lila paints the garden behind the violet gate, does that indicate a change in her? Is Lila justified to think she might inadvertently have caused Yuri to go postal?Is it truly important for her to understand his motive?What’s driving her?Did her quest help her, or was it a waste? How do Lila’s Pleaser, Crazy Aunt, and Horny Guttersnipe cause her stress or conflict?Does she have other qualities that might make colorful characters too?Does everyone have secret personalities that can take over and need to be controlled? When Lila dated Reed, her ex-boyfriend, she painted a series called Odd Juxtapositions.How might that title reflect Lila and Reed as a couple?How is Lila’s relationship with Adam different from hers with Reed? What does Betsy mean when she tells Lila to think with her heart?Is there a difference between thinking with your heart and with your mind?And what’s the difference between Sunday school forgiveness and Betsy’s forgiveness as freedom? Adam tells Lila, “Life isn’t predictable.Sometimes bad things happen to good people no matter what they’ve said or done.”Is that always true, or is there always a cause, like the butterfly effect?Was Lila at fault in her treatment of Yuri? Could she have contributed to his going postal? Adam says that Lila and Grace are similar because they both suffered from a random act of fate.Do you agree?How important is fate in the story?In what other ways might Lila and Grace be similar? What is the significance of Lila putting the ribbon around the stone duck’s neck?Does it reflect anything going on inside her? How is Lila’s visit with Olga and Marina Makov a turning point in the story?What does Lila discover about Yuri?And about herself? Betsy tells Lila that “hard times can be gifts” and getting shot might be the best thing that ever happened to her.Do you agree with Betsy?Do Lila’s hard times change her?What does she learn from them?